Grow your business with accurate and reliable Posture, Movement, and Body Composition Assessments. 4 view, 2 view, Quick Screen, and seated analyses anywhere and always in palm of your hand with PostureScreen! 2D photographic antropometric body composition analysis with LeanScreen! Or use true 3D scanning with Structure Sensor for true 3D body composition analysis along with reported measurement details! Use RemoteScreen to allow clients to remotely and securely upload photos and videos for your professional analysis! SquatScreen allows for fast, objective and functional movement assessments with auto-suggested corrective exercises for your clients! PostureScreen, LeanScreen, and SquatScreen all have direct integration with WebExercises to allow mobile exercise prescriptions directly from the applications! 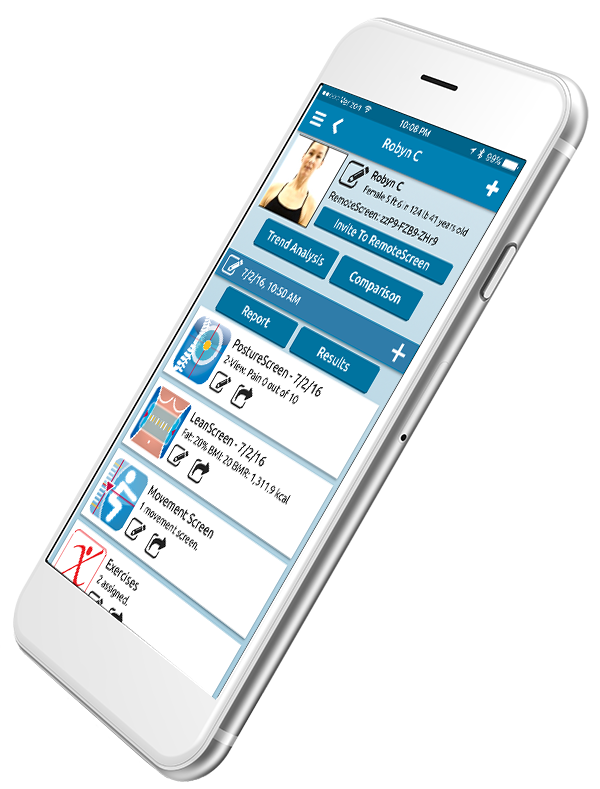 The best and the world’s most popular posture and movement analysis software is always in the palm of your hand. Designed for fitness professionals, chiropractors, physical and manual therapists who wish to screen for movement & postural dysfunction and prescribe corrective exercises. Use in marketing events to clinical assessments. Perform “virtual assessments” of your clients anywhere and anytime with RemoteScreen. RemoteScreen is a “client-facing” companion application for PostureScreen, LeanScreen, and SquatScreen. This application allows a professional’s clients to remotely upload secure photos and video for evaluation by the professional. Virtual screenings for remote training and assessments are now a reality! LeanScreen – the first application ever to accurately estimate percentage body fat and Waist To Hip Ratio from photographs!!! No longer will you waste time measuring a client with a tape measure or rely on calipers! With LeanScreen, you actually measure body dimensions in seconds using our proprietary patent pending anthropometric technology – all from photographs! Users can also perform true 3D assessments of clients and body shape with measurements with addition of 3D camera. Finally, Fast Objective Movement Screenings all on your iPad! The new movement screens module is an in-app upgrade within PostureScreen Mobile. Find overactive, underachieve muscle groups along with detailed documentation. In the initial release, you can evaluate AP (front) over head squat, PA (back) overhead squat, Lateral (side) view overhead squat, Push-up/Plank. Additional screenings coming soon! As a chiropractor, you must document your x-rays, now you can spend less time, and generate reports for both your records as well as patient education. PostureRay is the original and most robust x-ray report of findings software. You can easily and completely customize your reports for your unique facility branding as well! Don't be fooled by imitation providers on the market, our software is not only the original, but is also the most robust! Our software was created with the leading technique leaders and is the only software endorssed and recommended by the technique leaders of Chiropractic BioPhysics, Orthospinology, and CLEAR techniques. The PostureRay viewbox allows for side by side comparisions to near normal x-rays, with annotation and markup tools, along with easily calling up the patient's segemental values compared to normal. PostureRay can import DICOM, DMX videos, and photos of plain film x-rays in form of jpeg format.